Local artist Eileen Rehberg's painting is seen in the studio at the Times Free Press on Tuesday, April 9, 2019 in Chattanooga, Tenn. A replica of the painting will be given to the race winners of the 50th annual Chickamauga Chase. More than a thousand runners and walkers will loop around the Chickamauga Battlefield Saturday morning for the 50th edition of the Chattanooga Track Club's Chickamauga Chase benefiting the historic Civil War site. This year's event will increase funding for the park's preservation partners and will add a unique prize for winners made by a local artist. Two dollars from each registration will go to the National Parks Partners to help with programming and maintenance. The donation will be matched by the Lyndurst Foundation; participants will also be able to make additional contributions. "People are able to run 5ks anywhere; having a track clubs event is not a new thing, but once you're in the battlefield, you're in hallowed ground, running in the footsteps of history," National Park Partners Executive Director Tricia Mims said. "It's not something you can replicate." Local artist Eileen Rehberg poses with a painting in the studio at the Times Free Press on Tuesday, April 9, 2019 in Chattanooga, Tenn. A replica of the painting will be given to the race winners of the 50th annual Chickamauga Chase. The funding will be invested back into the park as the local non-profit dedicated to promoting the area's National Park system continues educational programming and park maintenance. The organization has a five-week summer youth program, conducts events with Outdoor Chattanooga and will look to add or expand additional programming. Event organizers have long provided a small donation to the non-profits that help with the park but wanted to contribute more as many of the participants utilize the park's quiet roads regularly to run, according to event director Stacey Malecky. The event will include a 15-kilometer road race, 5k road race, 8-mile trail race, 2-mile walk and Kiddie K for children 10 and under. Event winners will receive a copy of a painting made specifically for the event. The race has historically featured atypical prizes. One year it was belt buckles. Last year, it was Civil War era bullet shells found in the park system. "We like to do things differently than just getting a canned award we ordered from a medal company," Malecky said. Track club member Sujeel Taj had the idea of a painting for winners. He reached out to local artist Eileen Rehberg, the director of data analysis and strategy for United Way, to create the painting. Rehberg has two degrees in art and began her professional career as an artist before she found she couldn't make a living and went back to school. She stepped away from art entirely before returning to the craft about seven years ago as a hobby. "Art, you could say, is my first love," she said. The local resident now paints for herself and family members. Her favorite pastime is painting pictures of her grandchildren, but she also paints nature photos from her cabin in upstate New York. It was a daunting task to create a painting that would be widely viewed while also incorporating both the festivities of a race and the reverence of a battlefield, she said. "I was very tense painting this," Rehberg said. "I wanted it to be right. I'm never really happy with my paintings, but I think I tackled it with integrity." 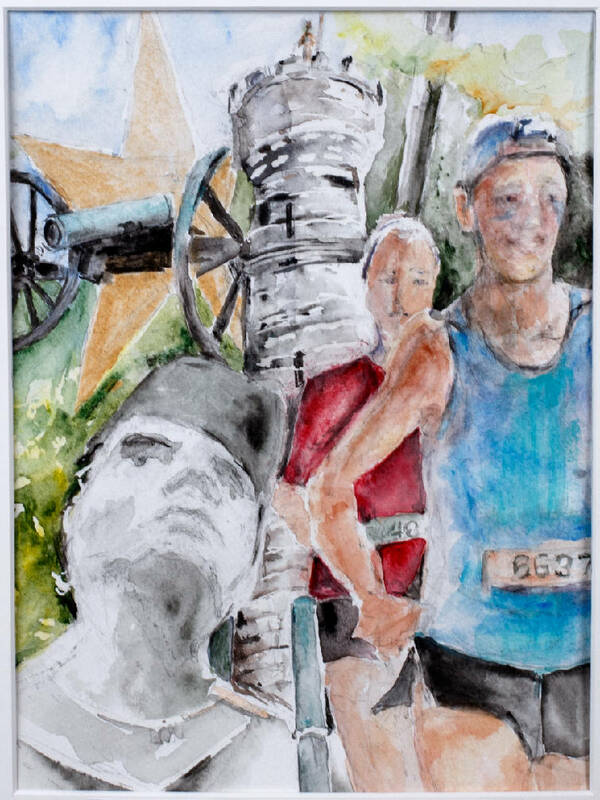 Her painting features scenes from the battlefield: Wilder Tower, a cannon and a soldier overlayed by two runners emerging from the painting. A star — a symbol used by both the Union and the Confederacy — is in the background as a unifying marker for the painting. The side the soldier fought on can't be identified. "This isn't about the North or the South but a unified painting," she said. The overall male and female winners of each race will receive 9-by-12-inch copies of the painting. Age group winners will receive 8-by-10-inch replicas. Rehberg and the track club are still determining what will be done with the original painting. Those interested in participating can register from 4-7 p.m. Friday at the Whole Foods on North Shore. Registration will also be held prior to the event in the field along Wilder Tower from 7-8:15 a.m. prior to the races. Registration fees range from $13 for the children's race to $42 for the 15k road race.